Industrial designer Jung Ou Yang imagined a very interesting Sony hybrid device, one that combines the functionality of a smartphone with the one of a tablet. 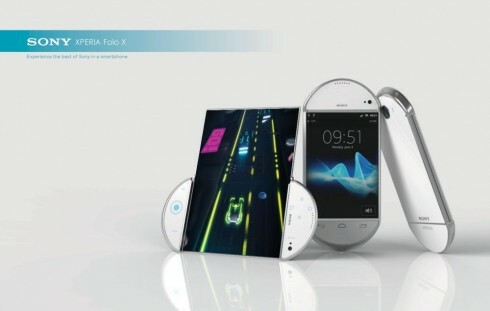 The concept is called the Sony Experia Folo X and it’s supposed to be the best entertainment smartphone in the world, packing a 5.5 inch Full HD LED display. 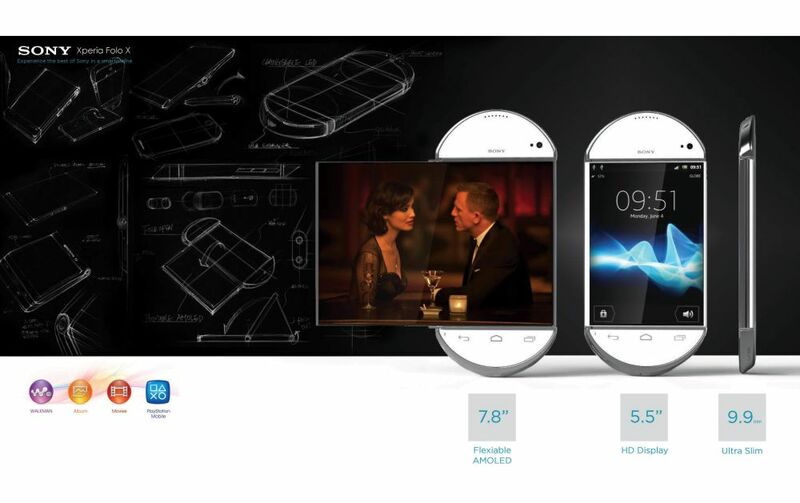 It also offers a 7.8 inch flexible AMOLED screen and it’s a PlayStation Certified smartphone with changeable touchscreen buttons. 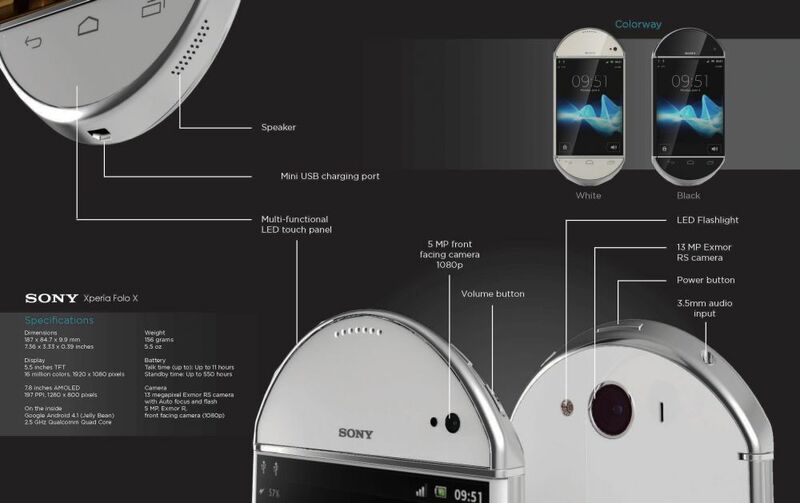 3D gaming with high end graphics is promised and the form factor of the unit is vaguely reminiscent of the Xperia Play. I love the gaming keys that appear on the sides of the device, that are probably capacitive areas. The foldable display allows you to create perfect self portraits and rid yourself of duck faces and bathroom mirrors. 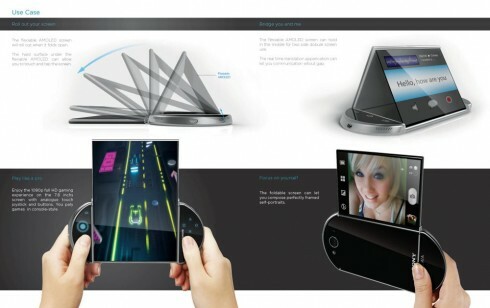 The flexible AMOLED display can fold in the middle and be used as two separate screens and there’s also a real time translation tool, plus the ability to communicate on both screens without gaps. So, in normal mode you have a regular 5.5 inch phablet, but when you unfold the screen, you get a 7.8 inch surface to play games on, as it’s shown in the pictures. The Sony Experia Folo X features a 13 megapixel Exmor RS camera with LED flash, a 5 MP front facing 1080p camera, a multi functional LED touch panel on the sides and a battery with up to 11 hours of talk time. The device measures 9.9 mm in thickness and inside it has a quad core Qualcomm CPU at 2.5 GHz. It’s important to mention that the 5.5 inch TFT display is 1920 x 1080 pixel in resolution, while the 7.8 inch AMOLED screen has a 1280 x 800 pixel resolution. The device weighs 156 grams and runs Android 4.1 Jelly Bean. Fancy such a powerhouse? I sure do and I can see myself playing on such a gizmo.